Damascus International Airport (Arabic, مطار دمشق الدولي) (IATA: DAM, ICAO: OSDI) is a public airport located in Damascus, the capital of Syria. 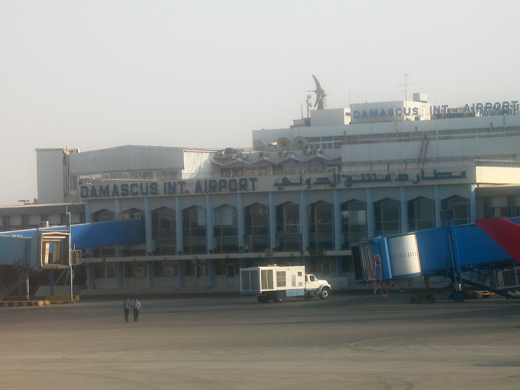 Officially opened in the mid 1970s, DAM is Syria's busiest international airport. The airport is experiencing significant annual passenger growth rates. In 2009, an estimated 4.5 million passengers used the airport, an increase of more than 50% since 2004. It is currently undergoing much-needed renovations. A new state-of-the-art terminal is expected to be constructed in the near future. The airport features several 2 duty-free outlets. The largest of these, operated by Syrian company Ramak. The departures hall also includes an in-house coffee shop, several souvenir shops, 3 restaurants, and a business/first-class lounge. Cheap transport to central Damascus is offered by several bus and taxi companies, namely EuroCar, Orient Tours, Chamtour, Victoria Rent-a-Car, and Marmou. Al-Karnak, the state bus company, also offers service between the airport and Baramkeh bus terminal. ^1 Although Conviasa's flight to Caracas stops in Madrid, Conviasa has no rights to transport passengers between Damascus and Madrid. Renovation a terminal 1 in capacity 3.5 million passengers per year in 2010 statistics. Construction a railway connected hijaz station in damascus. Construction a new terminal in capacity 7 million passengers per year. CAUTION Bird haz, especially Autumn thru Spring. LGT Rwy 05R VASI O/S. ABn O/S. Main twy and apn lgt O/S.